In a video I did recently, I talked a bit about these system-types that I originally posited in my book – the four “forms” of Toy, Puzzle, Contest and Game. This is not a breakdown of how I see things in the current state of game design, but rather a vision for what I think game design should be. Before we go on – prescriptive definition warning. I use common words to refer to very specific things, so if you see the chart and think “what the hell is this guy talking about” – simply read below. I elaborate in detail about what I mean. The main reason that this system is useful is because it gives game designers an abstract gameplay purpose to start with. It answers the question of “what should I be trying to do” at the most basic level. This might sound arbitrary to some – I’ll address that quickly before going in more detail on this new chart. Why are the systems Toy, Puzzle, Contest and Game, and not some other kinds of systems? What were these based on? As far as I can tell, these are the four things that a person can be doing when interacting with a system. I suppose that my evidence for this would basically be inductive – I cannot “prove without a shadow of a doubt” that these are the systems, but I have observed it, and I continue to observe it. In other words, every example of play I can think of fits well into this system. Secondly, even if it is not “the true four ways” in some absolute sense, it is a very useful way to divide things up. Of course, some existing systems use a combination of two or more of these types of interaction, but I have yet to find a fifth type of interaction that is unique from these. If anyone can think of one, or argue that one of the types of interaction that I have listed here is not appropriate, or that two of the types of interaction I’ve listed as different are actually the same, please let me know. Let me clarify these a bit, because some of these words might have connotations that I don’t mean, but they’re as close as I could get with the words I could find. 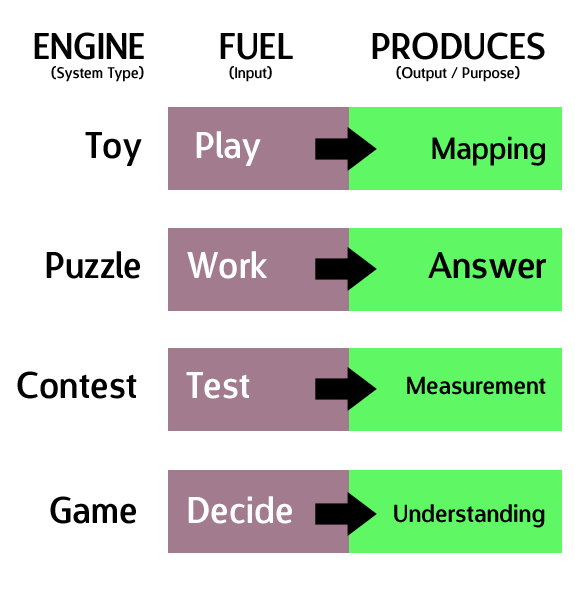 Toy – A Toy is any interactive system without a goal / problem to solve. This is not meant to imply any kind of correlation with “childishness” or anything. You can also call this a Bare Interactive System. Many simulators fall into this category. Play – I mean “play” as in the expression “to play with”, or “to mess with”. This isn’t to say that this work is necessarily trivial, but rather that it’s exploratory. Mapping – This is the result of the play I was talking about. With play, we are finding edges, figuring out how a thing will respond. Eventually we end up with some kind of mapping of how this thing works. Interestingly, you could say that the object of a toy is to discover its rules. HOW CAN WE USE THIS? A good toy will have a vast amount of rules to discover. Think Legos, or Minecraft, or a ball. Puzzle – Don’t think about the normal colloquial (and very messy) “puzzle” word. I simply mean anything with a goal / answer / problem. So, a math problem counts as a puzzle. Answer – This is the objective we were searching for. Once the answer is found, the puzzle is no longer of value to us, because the search for the answer was where the value was. HOW CAN WE USE THIS? A good puzzle will have a difficult-to-find answer. Obvious to most people, yes – but it’s still true. Contest – Thankfully, this definition lines up pretty closely with the colloquial definition, so not much explanation needed here. Test – Think “stress test”. We are attempting to find the limits of something. Note that this is unlike the wide, lateral exploration of “play”. This is a vertical, straight test of one specific resource. Measurement – Measurements are inherently relative and can have no meaning without something to measure up TO. Therefore, all contests compare the measurement (result) to another result, and determine a winner and a loser. HOW CAN WE USE THIS? Good contests don’t have a low “cap” on that vertical skill possibility space. Game – This is the most controversial word I use in my system. Some prefer “decision-contest” and some have suggested “strategy game”. Either way, the point is that this system, as I define it, is a “contest of decision-making”. The concept is what’s important here. Decide – The nature of a decision is very interesting and not trivial. People have argued to me before that button-inputs in Guitar Hero are “decisions”. I disagree with this characterization; I think it would then follow that if you were walking and tripped, that you decided to trip. “Why did you decide to trip”, only a jerk would ask, because obviously you did not decide this. To help understand this aspect, perhaps think of decisions, in this context, as conscious decisions. The answer is “a”; there’s no ambiguity here, so this does not qualify as what I refer to as a decision. Understanding – What we gain from a game is a holistic understanding of a set of rules and their ramifications, synergies, and connections. This is not the same as what we gain from a toy, which is a list of rules. Instead, this is an understanding of rule relationships, and how to manipulate the system to our benefit. Obtaining new bits of understanding is of value to us, but once there’s no more understanding to gain, the game is dead. HOW CAN WE USE THIS? A game should have a very vast and deep set of rule relationships that we can explore for as long as possible. Anyway, I hope this is helpful for people in understanding my work. Let me know if anything doesn’t add up!